Halloween might come only for the latter to Mei-Shun. She receives many kind of sweets from family and friends, caught in a big dilemma between appetite and wellness these days. As for her stage performance next week, she has planned to lose a weight in preparation. But oh, how superb this cookie tastes! Eat less while keeping your diet balanced. Walk and workout for 30 minutes respectively, dance a whole score of 汐汲 once a day. Yes, she must put it into practice. It was lucky for Mei-Shun to see them on the back of T.T. — Tosen Treasure, a thoroughbred boy with pretty eyes and a round star on forehead. 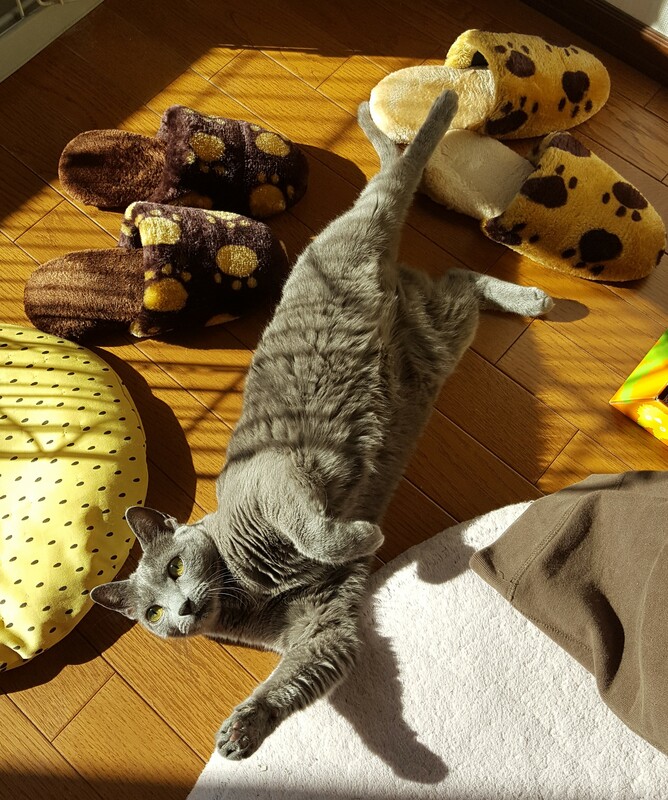 Still single digit years old, he is very kind and friendly, let her feel relaxed after two weeks. Well, does it mean a little progress in her technique? You are supposed to look up while keeping your back straighten up on horses, which is not so easy for beginners. Oh, please wait until next lesson for photos; merciless shower began to beat lovely flowers. Mei-Shun, her mother and elder sister met with each other today finally: They enjoyed an okonomi-yaki party after almost a whole year. 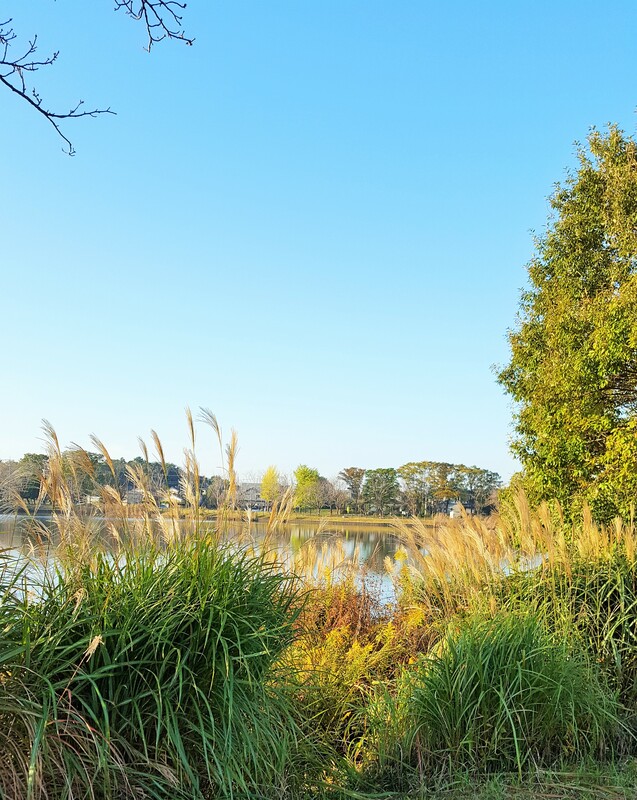 They had gathered for celebrating mother’s birthday in early summer, before Shin and Mei-Shun made visit to her in 草津 one of their happy regular excursions. The only problem of this idea is that Mei-Shun lacks a chance to see her sister. Mother worried about it, offered her younger and freer daughter to arrange a lunch at her home. … share top of Mei-Shun’s favorite piano score list. Mov. III of the former was the last for her to play in front of audience when she was 17. Such difficult one never let her relax, that Mov. I and II are among her repertoire. They tend to appear on Ms. Piano in rainy days, while it rarely does this month. It is why Mei-Shun makes it an excuse to choose these soothing scores that we see the moon later at night after 十五夜. This morning was chilly, hit the lowest temperature I heard. Mom woke up earlier and helped me come out of the cage, purr. I love these new slippers full of my marks! Dad and mom put them on, give my favorite air to sniff, purr, purr. In the afternoon, however, it suddenly started raining. Mom rushed to futon mats hung outside, hiss! Such a weather is like my feeling called 女心と秋の空, meaning girls’ mind resemble autumn sky easy to alter. Dr. A gave Mei-Shun a “Yes” phone call on Saturday, after the latter went out for shopping in the morning. Weekend department store is crowded with parking space nearly full. 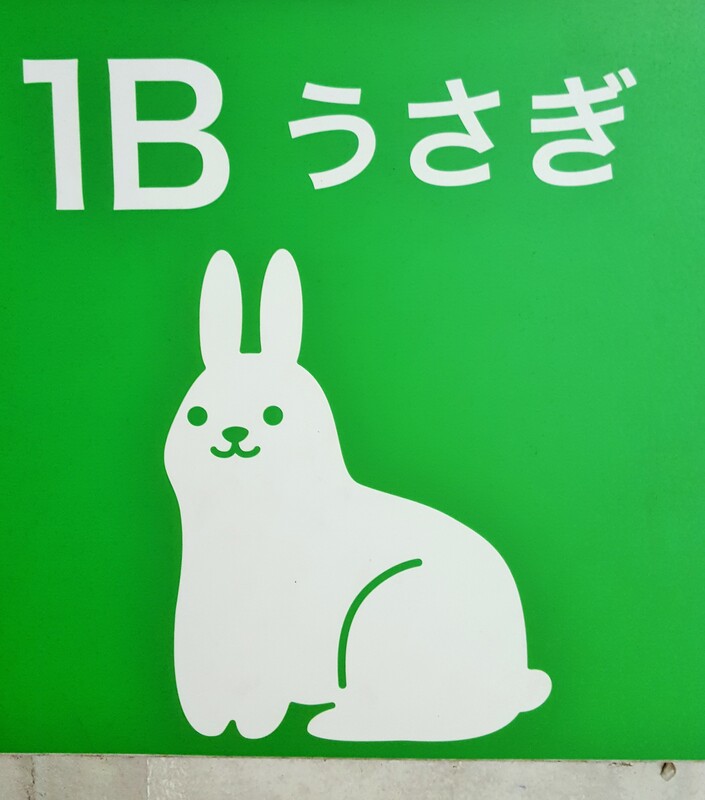 However, on the floor put a sign of white rabbit as shown below, one car drove out just before Mei-Shun reached there. By the way, rose scent tour last week seemed to be won by another kind rabbit on a postage stamp following next to the one for drivers. 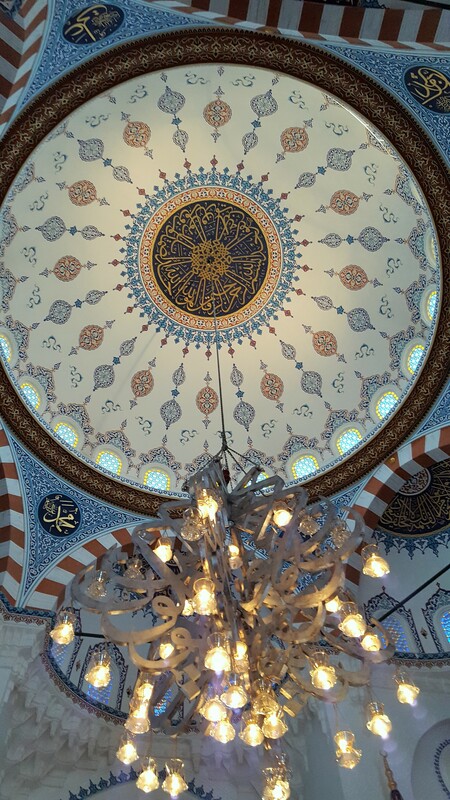 It is great honor for Mei-Shun to have a chance to visit a mosque for the first time led by Professor S, who is major in interfaith dialogue. 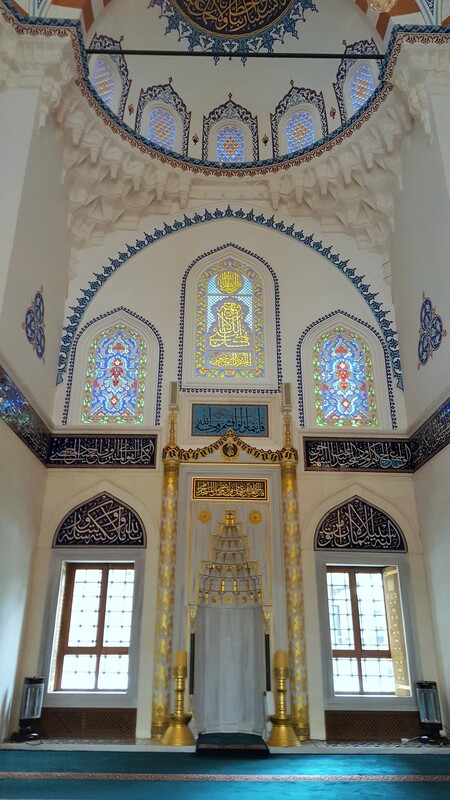 Tokyo Camii & Turkish Culture Center is in Shibuya Ward, an amazing place of Islam and art. 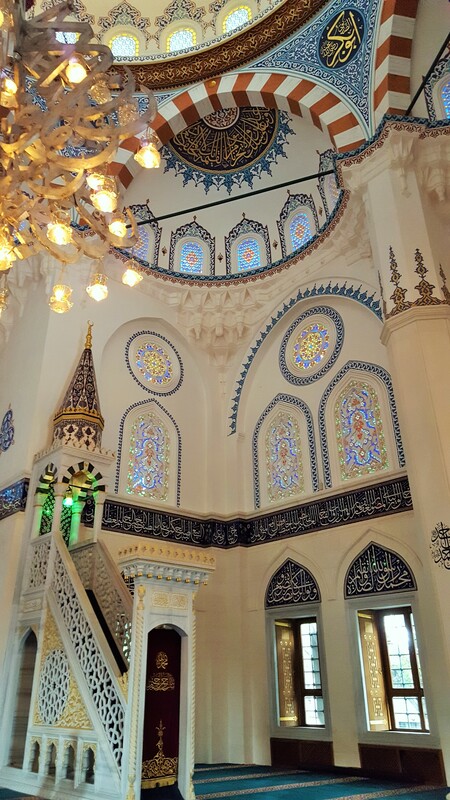 Marble walls and stairs with an impressive dome and minarets suddenly appear among tall trees. 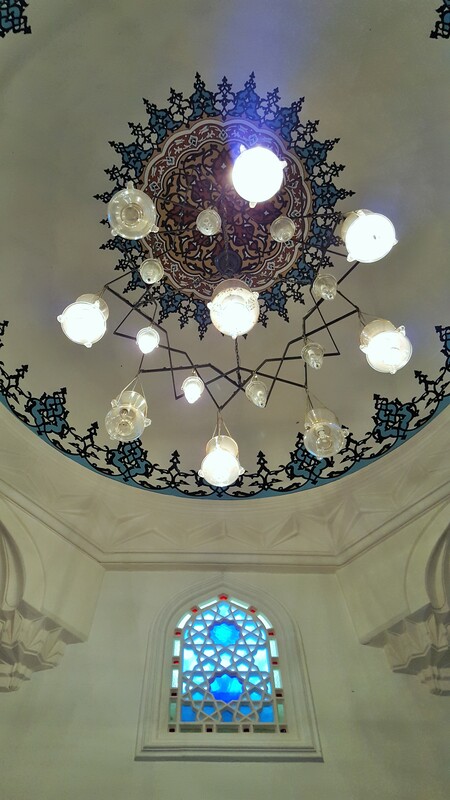 Now indoors taking off shoes, shining stained glasses and arabesque patterns jump into your eyes. Adhan by an imam sounds incredible, just like fantastic music.